A wild and hazy ride with Sir Paul. Paul and Linda McCartney famously claimed that the only time they ever spent apart was when Paul was incarcerated in a Japanese jail on a marijuana bust. This happened in 1980, the same year his second solo album was released, McCartney II. 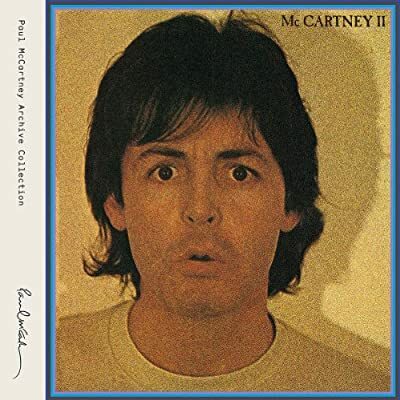 After listening to the remastered, two-disc Paul McCartney Archive Collection edition of McCartney II, I have to wonder if it really was a drug bust. From the audio evidence presented here, my guess is that the event was really a well-disguised intervention. How else does one explain such songs as “Bogey Music” and “Frozen Jap,” except as the result of way too much weed? Oh yeah, and an unhealthy fascination with the new Casio keyboards of the day. Believe it or not, Pac-Man-style blips and bleeps were once considered futuristic. And McCartney II is filled with ’em. The hit single “Coming Up” leads things off, and is more or less a traditional McCartney song. The tune contains its fair share of dated synth sounds, but overall is a decent enough effort. But hold on, from here on out we are in for one wild ride. “Temporary Secretary” is a prime example. In it, Paul shows a particular obsession with the fact that the two words (sort of) rhyme with each other. World renowned songsmith that he is, McCartney solves the problem with selective pronunciation. “Temp-er-ary Sec-er-tary” goes the refrain, and another brain cell bites the dust. With a title like “Summer’s Day Song” I was expecting a bright, sunny tune to break up the incessant Atari atmosphere. No dice. This track is colder than the group Icehouse were, and their name was perfectly chosen. But Mr. “Scrambled Eggs” is not through yet. “Darkroom” is the single creepiest song he has ever done, and that includes “My Love.“ If some misguided soul ever decided to make a film celebrating serial killers, “Darkroom” would be the theme song. The joyously perverse nature of McCartney II is present right up to the end. “One Of These Days” closes things out in a charmingly inoffensive way, which just adds to the head-scratching strangeness of the whole thing. As is traditional with these Archive Collection releases, McCartney II contains a second disc of outtakes, B-sides, and live tracks. True to form, the extras are as off the wall as the album proper. The first of these is an orchestrated number titled “Blue Sway.” It is a great instrumental, but would have been completely out of place in the videogames-gone-wild environment of McCartney II. There is also a live version of “Coming Up,” recorded at the same 1979 Glasgow show that produced the live extras on Paul’s first solo set, McCartney. Our hero hits the proverbial ditch with two ten-minute plus bonus tracks. Both “Secret Friend,” and “All You Horse Riders”/”Blue Sway” are way too long, but by this point I was beyond caring. If a person gets this far, the contact high alone will have them completely baked, no indulgences necessary. The maraschino cherry on top has to be “Wonderful Christmastime.” Paul’s perennial holiday tune is a major guilty pleasure of mine, I look forward to hearing it every year. Having never fully listened to McCartney II previously however, I had no idea it emerged from such a hazy time in the ex-Beatle’s career. At this point in a review, I generally sum up the recording and give it a thumbs up or thumbs down appraisal. To be honest, in the case of McCartney II, I am at a loss for words. It is so far outside of anything in the man’s extensive catalog as to exist in a world all its own. As the only person in my circle of friends who actually liked Lou Reed’s Metal Machine Music, I have a feeling this album will one day be my favorite of McCartney’s. But I’m not there yet. As for the intervention in Japan theory, it becomes more and more plausible with each listen.